A world premiere at the Blyth Festival by Paul Thompson and Gil Garratt takes on the history of the Donnelly family yet again. 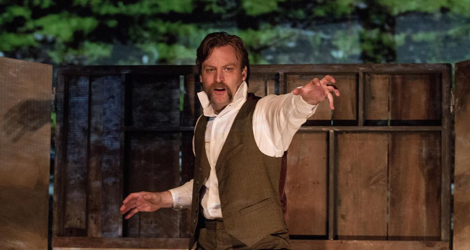 The twist with their new play, The Last Donnelly Standing, is that it looks at the events before and after the infamous massacre of the Donnelly family in 1880 from the point of view of Robert “Bobby” Donnelly (1853-1911), who was away from home at the time five members of the family were murdered and the family home burned down. Gil Garratt, Artistic Director of the Blyth Festival, gives a virtuoso performance not only playing more than ten characters, men and women, Donnelly and not, but also accompanying his songs with a variety of instruments. Before the play begins Garratt makes a spectacular entrance by riding a horse to the Blyth Memorial Hall as Bobby Donnelly and alighting before entering the theatre. In Act 1 Bobby, or more accurately his ghost, tells the story of the Donnellys up to the massacre and fire. In Act 2 he tells the less well-known story of how Bobby coped after discovering what happened. As Bobby, Garratt addresses the audience directly and expects audience participation. When Bobby needs more people in the pews for his marriage to Annie Currie in 1873, Garratt chooses several members of the audience to sit in pews on the groom’s side. When Bobby gets to the massacre itself, he tells us, “This is the part you’ve all been waiting for, isn’t it?” as if taunting us with our own curiosity about the gruesome event. The first thing we hear is how Bobby, returning to Biddulph and seeing the cabin his father built burnt down to the ground, took four large stones to mark the four corners of where the house stood. From that opening on we see that Bobby’s narrative will be a commemoration of his family from a surviving son’s point of view, not an investigation into his or his family’s alleged crimes. We learn of Bobby’s struggle to sit in the centre of a bench at the dining table so as not to be pushed off the edge by one of his brothers. Bobby teaches Billy poetry such as William Blake’s “The Lamb” and “The Tiger”, the fire imagery of the latter continuing through the narrative. When Bobby’s father is sentenced to hang for the murder of Patrick Farrell, Bobby’s mother collects a petition pleading for clemency which is successful. The murder conviction is commuted to seven years in Kingston Penitentiary. Billy is acutely embarrassment when he is forced to publish his love letters to his wife Norah Kennedy, whose family accused Billy of abducting her. We also learn about the battle between rival stage lines – one owned by Billy Donnelley who employs Bobby, one by rival Patrick Flanagan – in which each group sabotages the other’s property. Bobby becomes the direct object of the community’s general hatred of the family when a constable claims Bobby tried to shoot him and Bobby is sentenced to two years hard labour in Kingston. Since we see only Bobby’s view what is never mentioned is that the constable later admits he doesn’t know who fired the shot. For the same reason the authors will have Bobby say that he was walking past a barn and got a little careless with the kerosene. Bobby was in St. Thomas when the massacre occurred. After the massacre that Bobby describes in vivid detail from what he has heard, Bobby decides to move back to Lucan and build a house right on the main street so that the town will not forget there is a Donnelly among them. He also raises a large pillar-like monument to the family in the local cemetery stating that they were “murdered” even though none of those involved were ever charged. In a passage for which we would like more background, Bobby finds himself undergoing psychiatric evaluation in a London Psychiatric Hospital and is later discharged. Perhaps because of survivor guilt he has a recurrent nightmare of being trapped in a burning house. Bobby continues his story beyond his death by relating how his wife violated his loyalty to his family, by having him disinterred from the Donnelly plot to be reburied in London where she wants to be be buried. The emphasis on Bobby would lead anyone to believe that he is the title character. In fact, as we learn it is Bobby’s older brother Patrick, who is alive after Bobby’s death and delivers his eulogy. Bobby’s narrative is necessarily episodic, but the show would be more satisfying if playwrights Paul Thompson and Gil Garratt could lend it more cohesiveness. Nevertheless, the production finds some unity through other means. One way is through the songs that Garratt sings that reflect on the incidents he, as Bobby, has mentioned. Another is through images that recur through the show, especially of stone and fire. This imagery is highlighted and expanded by co-creator Beth Kates’s video projections covering the whole back wall that accompany the entire show. Sometime they projections give concrete form to objects Garratt’s characters mention, sometimes they provide an historical background to the action, and sometimes they show period photographs featuring Bobby that Garratt recreates live. Garratt is a remarkable performer. He plays more than ten different characters, male and female, young and old, even managing to distinguish clearly among the various Donnelly brothers through tone and gesture. The main character is, of course, Bobby, whom Garratt lends the qualities of a likeable but potentially dangerous rogue. Garratt’s songs allow him to display his talents on the guitar, fiddle, banjo and accordion. 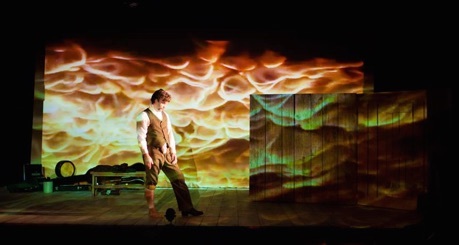 Like Garratt, Kates’s ingenious three-panelled set piece easily morphs from one setting to another so that Garratt, the set, the projections and Lyon Smith’s sound design form an interconnected nexus devoted to telling the story. Thompson and Garratt's inclusion of Bobby’s trip to the World’s Columbian Exposition of 1893 in Chicago has major importance in the show. Bobby’s ride with his family on the 80-metre-high Ferris wheel and later in a hot air balloon, where fire is not used for destruction, give Bobby a new perspective on the world in which people look minuscule and the world seems full of possibilities. The authors do not have Bobby say so but this section suggests that Bobby at last has some perspective on the pettiness of the turf wars that have characterized the Donnellys’ life in small town Ontario. It is perhaps for that reason that he seems to accept with some irony that his wife does not respect his final wishes even after he has died and been buried with his family. 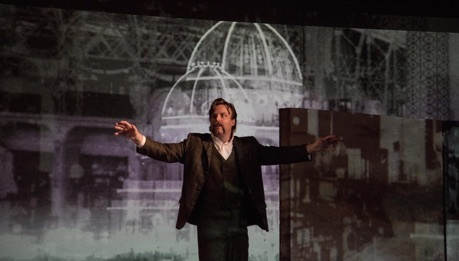 The Last Donnelly Standing is an evocative multimedia work that makes Ontario history come impressively to life – surely the goal that the Blyth Festival has had since its inception. Photo: (from top) Gil Garratt as Bobby Donnelly; Gil Garratt as Bobby Donnelly; Gil Garratt as Bobby Donnelly. ©2016 Terry Manzo.